The Regional Consultative Committee on Disaster Management (RCC), established by the Asian Disaster Preparedness Centre (ADPC) in 2000, is comprised of members working in key Government positions in the national disaster management systems of countries across Asia and the Pacific. Its role as a consultative mechanism for regional cooperation is recognized and affirmed by the Charter of ADPC. To date, 26 countries are represented by 30 RCC Members from the Asia and Pacific regions, namely, Afghanistan, Bangladesh Bhutan, Brunei, Cambodia, China, Georgia, India, Indonesia, Iran, Jordan, Kazakhstan, Korea, Lao PDR, Malaysia, Maldives, Mongolia, Myanmar, Nepal, Pakistan, Papua New Guinea, Philippines, Sri Lanka, Thailand, Timor Leste and Viet Nam. The RCC has established a system of Chair and Vice Chair in the intervening period between the two meetings. The host country of the meeting assumes chairmanship and the incoming host country acts as the vice-chair and takes over when it hosts. 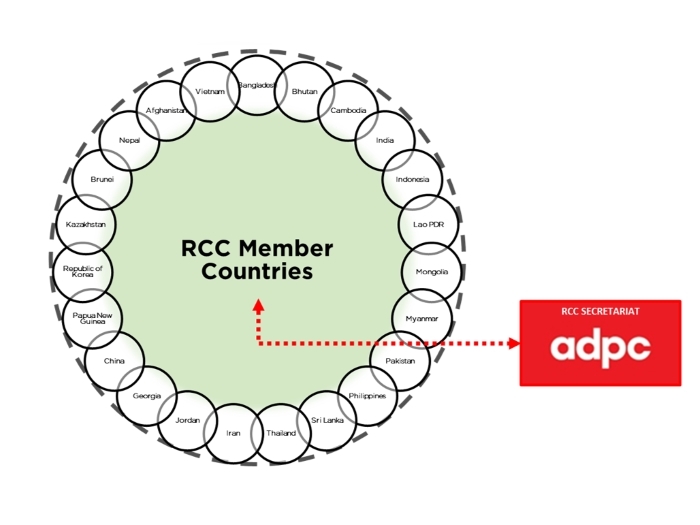 Each RCC meeting adopts a specific theme, selected by the host country. Member countries are then invited to present their achievements, challenges, and good practices in relation to said theme. Additional sessions are held for the host country to showcase its achievements and good practices in disaster risk management, and for other member countries to share their lessons learnt in disaster response, recovery and reconstruction. Sessions discussing progress on the implementation of the Sendai Framework for Disaster Risk Reduction in Asia and the Pacific, and issues related to regional cooperation for DRR are also organized.